It’s always great to leave Cebu for a few days and explore some of the not so touristic parts of the Philippines. A few months ago I took the ferry down to the incredible beautiful island of Camiguin off the north coast of Mindanao (you can read my post here), and last month I decided to go on another trip, this time to the capital of Mindanao: Davao. Everyone seems to have heard about Davao, but still relatively few foreigners make their way down to the second biggest city in the Philippines. 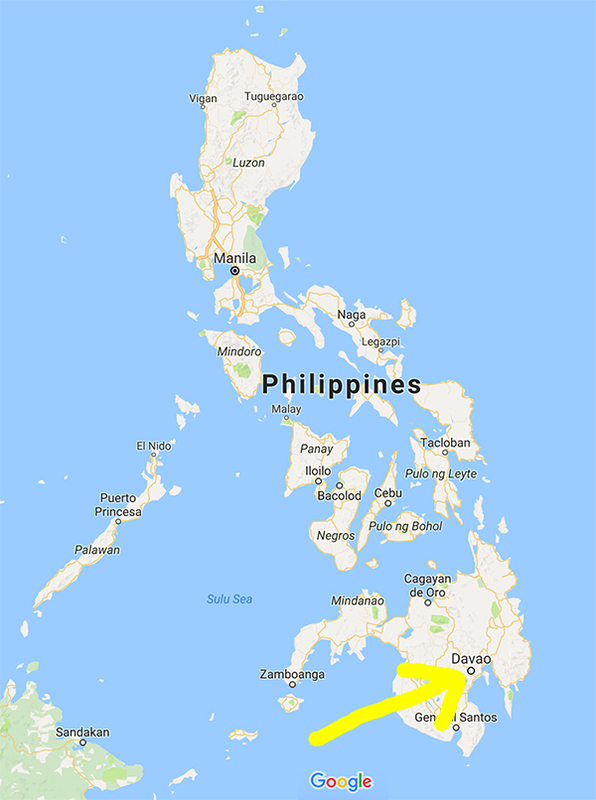 Let me emphasize right away that Davao is just as safe as Cebu, Manila or any other major town in the Philippines – in case you worry about the news of kidnapping by Muslim separatists, these are almost exclusively limited to the southwestern part of Mindanao. Davao is right on the other side of this huge island, far away from all the trouble. Anyway, I don’t want to encourage you to visit Davao by telling you how safe it is, but by showing you some really fun things you can do here. 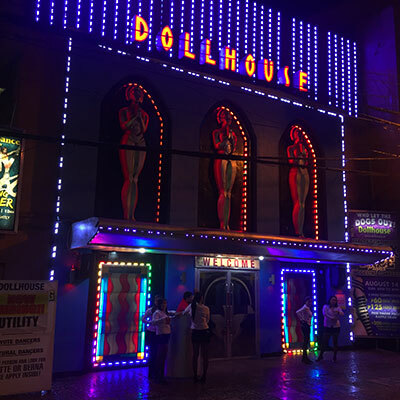 Yes I know, with “fun” I also mean banging young and hot local ladies (you will get a lot of attention here from the girls, because there are so few foreigners) and I have already covered this topic in all detail in several posts – to start, check out my overview guide to the nightlife and girls in Davao. Visiting Eden Nature Park was the highlight of my trip to Davao. It’s located a few hundred meters up Mount Apo, the 2,954m high mountain west of Davao City. It’s about 27km from downtown Davao to Eden Nature Park. Of course the easiest way to get there is by taxi (1,300-1,500 Pesos return), but I wanted to save a few bucks and have a nicer adventure, so I took the jeepney to Toril (20 Pesos), and from there a motorcycle to the park entrance (100 Pesos, if you are with a friend, then you can also share a tricycle for 150 Pesos). 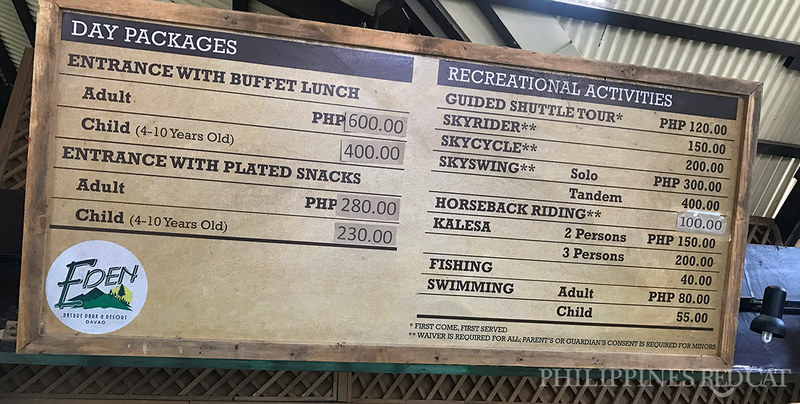 I chose the Buffet Lunch option for 600 Pesos – good decision, it turned out to be the best Filipino food I had here, including several main dishes as well as lots of fresh fruit, drinks and salads. At 1pm I joined the Guided Shuttle Tour (120 Pesos). Important: Make sure you buy that ticket right when you arrive, as they are often fully booked and/or you have to wait an hour or two until you can join the tour. In my case I had to wait for 90 minutes, which was just fine as I could eat lunch and take a small walk around. I took a video of that shuttle tour (and everything else in the Eden Nature Park), which you can find at the end of the guide. After I returned from that 60 minute tour, I walked to the adventure area of the park, which is just a 15 minute walk away from the main visitor center. I bought a combo ticket for 300 Pesos which included Skycycle and Skyrider. It was a lot of fun, and it’s not as scary to ride these bikes as you might think when looking at the photo. The view is superb – don’t miss it. I traveled back to Davao the same way as I got here – moto to Toril (100 Pesos) and from there a jeepney to downtown Davao (20 Pesos). 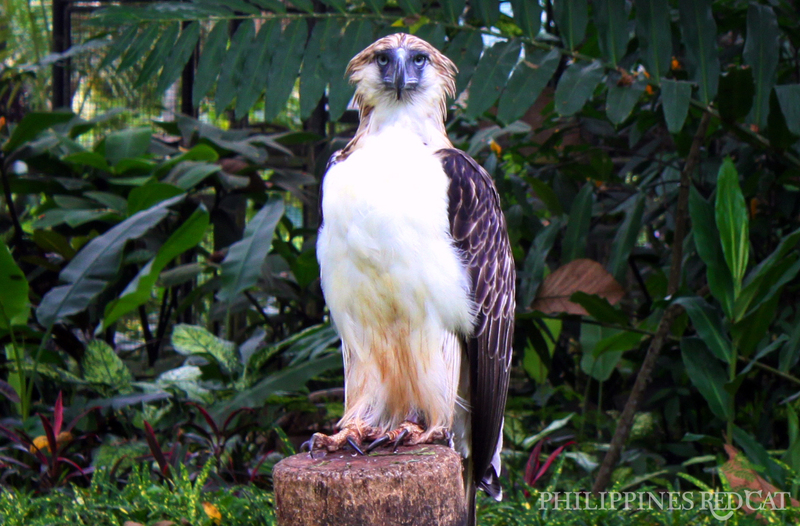 In case you didn’t know: The Philippine Eagle is the national animal of the Philippines, and you can see him here live. The Filipinos are incredibly proud of him, and whenever I meet Filipinos abroad, it’s always a good way to let them know that I have really been to the Philippines and appreciate their culture. There are a few other birds, too, but of course it’s the Philippine Eagle you come here for. The Davao Eagle Center is located about 33km west of downtown Davao, and if you don’t want to take a taxi for about 1,500 Pesos return, you can simply take a jeepney (30 Pesos) – just inquire at your hotel, because they change the routes all the time. The next highlight in Davao and something you should not miss when visiting here – the island of Samal, located less than 2km off the coast of Davao. Well, that’s the narrowest point where you can (and should) take the ferry. 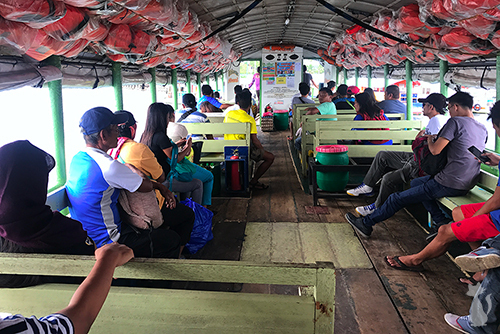 Once again, I didn’t join an overpriced day tour and instead did everything by myself: I took the jeepney to Samal Ferry Pier (15 Pesos, 30-40 minutes, usually lots of traffic) and then the ferry to Samal island (12 Pesos, 15 minutes). When I arrived there, I negotiated with one of the motorcycle drivers to take me around. Yes, you will need one as the distances are too big to walk – it’s about 28km to the main beach. 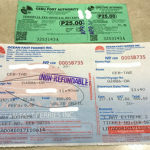 We agreed on 800 Pesos for visiting 3 places and returning to the ferry pier. The first stop was the Lagoon & Hagimit Falls in the interior of the island. Beautiful place, there are lots of Filipinos (and also some foreign expats) hanging out with their friends or family, swimming in the different lagoons (it’s not just the one in my pic! ), eating, drinking, and relaxing. The next stop was the View Point on top of a small hill. The views were nice, but not that spectacular to be honest. And the last stop was Kaputian Beach. Crystal clear water and nice to take a swim, but unfortunately I wasn’t very lucky with the weather, we had to rush back to the ferry pier shortly after to avoid the big rain. 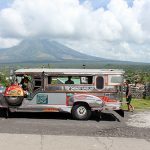 These are the 3 main highlights on Samal, but if you have more time, you can also ask your driver to bring you to even more places, such as the huge cave in the northern part of the island. It’s really like a small zoo, but I guess “Crocodile Park” markets better. This is probably the nicest place to visit in downtown Davao during the daytime, and well worth the 250 Pesos entrance fee. There are 4 crocodile enclosures with hundreds of crocodiles (no joke) in the center of the park, surrounded by dozens of other enclosures with all sorts of different animals, such as bats, ostriches, peacocks, monkeys, tigers, lions, lots of birds and also snakes. You will also see plenty of lovely local girls from Davao, a lot of them come with their girl friends so that’s a good opportunity to say hi and ask for other recommendations on things to do in Davao. It’s a little bit far to walk to the Crocodile park from your hotel in downtown, not because of the distance, but because of the fact that there is a river between and you would have to walk a long way around and over a distant bridge. Just take a taxi, it should cost less than 100 Pesos (meter). People’s Park is the nicest and most popular park in Davao. You will find lots of local Filipinos of all ages hanging out here, especially in the late afternoon when the hottest hours of the day are over. A unique feature of the park are the wooden sculptures of the indigenous people of Mindanao, illustrating their way of life. I took the above picture in front of the Aldevinco Shopping Center, as it shows how fun it can be to just randomly walk around downtown Davao. SM City Davao and SM Lanang Premier are other, “real” shopping malls which are popular during the daytime. You might think these girls are prostitutes waiting for customers, but in fact they are shop employees waiting for, well, customers. Like I already mentioned before, since there are so few foreigners in Davao, you will get a lot of looks and smiles from the girls – and it’s not difficult to use that to your advantage. Enjoy, and let me know how you liked your trip to Davao down in the comment section.